The Comcast Foundation, founded in 1999 to provide charitable support to its local communities and to empower and enrich lives, is awarding 97 Maryland high school seniors scholarships through its annual Leaders and Achievers® Scholarship Program. The program, one of the Comcast Foundation’s signature community investment programs, recognizes students’ leadership skills, academic achievement and commitment to community service. 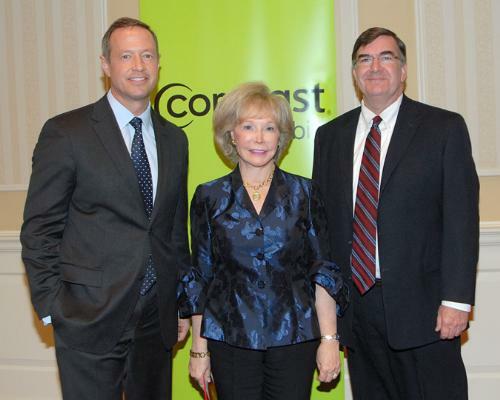 Comcast, joined by Governor Martin O’Malley, Maryland State Superintendent of Schools Dr. Nancy Grasmick and state legislators, recognized the students at a special event held at the Miller Senate Office Building in Annapolis yesterday. Ninety-six of the 2011 Maryland Leaders and Achievers recipients received $1,000 scholarships and Abida Kazmi of Parkville High School in Baltimore County was awarded a $10,000 Comcast Founders Scholarship — instituted in honor of Ralph J. Roberts, Founder and Chairman Emeritus of Comcast Corporation — for a total of $106,000 awarded this year. After a prize drawing, seven students were also given an iPad to use at college. The Comcast Leaders and Achievers® Scholarship Program provides one-time $1000 scholarships to students who strive to achieve their potential, who are catalysts for positive change in their communities, who are involved in their schools, and who serve as models for their fellow students. The philosophy behind the program is to give young people every opportunity to be prepared for the future, to engage youth in their communities, and to demonstrate the importance of civic involvement, and the value placed on civic involvement by the business community.